Every Mets fan I know can’t think of Tom Glavine without remembering his awful performance on September 30th, 2007. But let’s be fair to one of baseball’s newest Hall of Fame members – in five seasons with the Mets, he put together a 61-56 record with a 3.97 ERA. Those 61 victories rank him 11th in team history, and Jonathon Niese is going to need a 19-win season to push past him in 2014. Glavine also recorded two post-season victories for the Mets in 2006 — that’s two more than Mets Hall of Famer Dwight Gooden has. 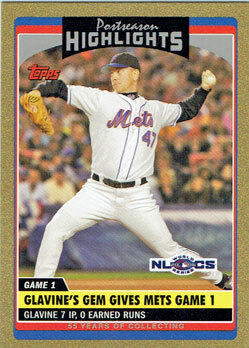 One of Glavine’s post-season victories came in Game 1 of the 2005 National League Championship Series, which is what this baseball card from the 2006 Topps Update and Highlights series commemorates. Glavine held the Cardinals to just four hits and two walks over seven innings as the Mets opened the series with a 2-0 shutout win. This card is the gold-bordered parallel version of the regular card – it’s serial numbered on the back and limited to “just” 2006 copies. If you can find them, gold parallels generally sell for about a quarter (unless the player is a local star or it’s a notable rookie card.) However, because they draw little interest, the gold parallels are often relegated to dealers’ and collectors’ commons boxes.